Call me a scrooge but I’d never spend a lot of money on a micellar water. I just don’t see the point. All the do is cleanse the skin. They may be a godsend when you’re rushing to get ready in the morning, need to remove your makeup in the middle of the afternoon and have no water nearby or have sensitive skin that can’t tolerate most cleansers. Improves solubility of the makeup into the surfactants: it gives the cleansing agents a boost so they remove your makeup better and faster. Both Lancome Eau Micellaire Doucer and L’Oreal Paris Micellar Water Normal To Dry Skin use the same type of glycol, Hexylene Glycol. Micellar waters are so gentle on the skin because they use non-ionic, non-foaming cleansers. They are milder than traditional cleansers like sodium laureth sulphate but take longer to remove all the dirt from your face. That’s why you sometimes need two or three cotton pads to get the job done. Again, both micellar waters use the same types of these non-ionic surfactants: Poloxamer 184 and Disodium Cocoamphodiacetate. There’s not much to say about them. They’re mild so they struggle a bit more to remove everything. But if you have the patience, they get the job done without irritating your skin. Is the trade off worth it? If you have sensitive skin or need to get your makeup off in a pinch, yes. L’Oreal Paris Micellar Water Normal To Dry Skin is a stripped down version of Lancome Eau Micellaire Douceur. It contains all the basics stuff that cleanses your skin without the added frills. For once, I don’t mind. The L’Oreal Micellar Water may not have the same lovely rose scent of the Lancome Eau Micellaire but is free of the alcohol too. Alcohol Denat is one of the most drying ingredients used in cosmetics. I don’t know why Lancome felt the need to include it, but if you have sensitive skin, this is one more reason to go with L’Oreal instead. 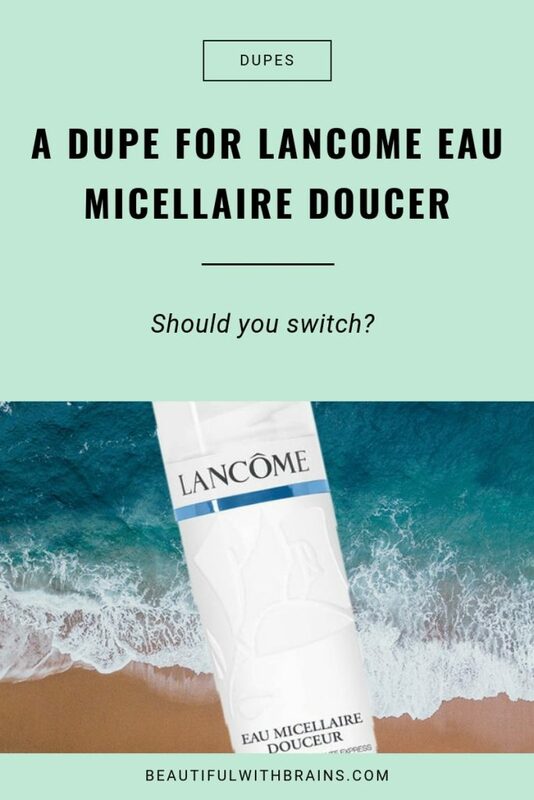 Is L’Oreal Paris Micellar Water Normal To Dry Skin A Dupe For Lancome Eau Micellaire Douceur? Yes, L’Oreal Paris Micellar Water Normal To Dry Skin is a stripped down version of Lancome Eau Micellaire Douceur. It has all the good active ingredients minus the drying frills. Have you tried Lancome Eau Micellaire Douceur and L’Oreal Paris Micellar Water Normal To Dry Skin? Share your fave in the comments below. L’Oreal Paris Micellar Water Normal To Dry Skin Ingredients: Aqua / Water, Hexylene Glycol, Glycerin, Poloxamer 184, Disodium Cocoamphodiacetate, Disodium Edta, Polyaminopropyl Biguanide.